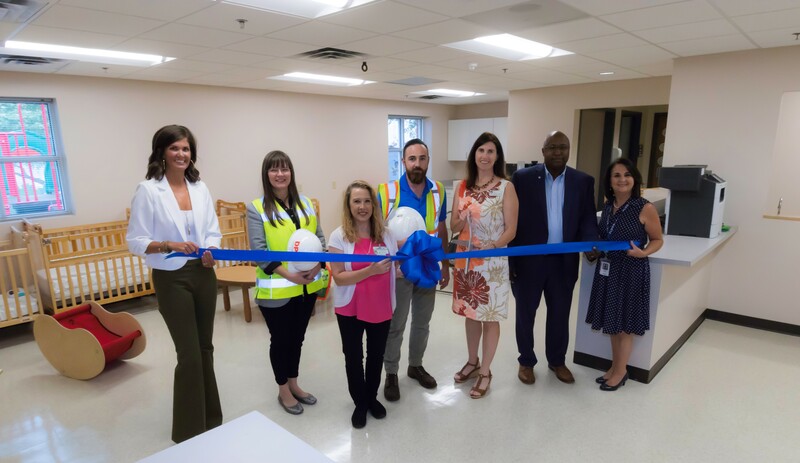 Greenville, SC (August 10, 2017): A ribbon-cutting event has officially opened the new room for the Wonder Center at the Center for Developmental Services (CDS). The Wonder Center is a day treatment program for medically fragile children between the ages of four weeks and six years. The Center is staffed by pediatric nurses and a child development specialist from Children’s Hospital of Greenville Health System (GHS), who provide extraordinary care and activities for the children. Dana McConnell, CDS Executive Director, commented, “This new addition will give many parents peace of mind, and it is all because of the generosity of Fluor employees.” In May, CDS was one of four local nonprofit beneficiaries selected for the 2017 Fluor Golf for Greenville event where more than $600,000 was raised. Pictured in the photo from L-R are Kelley Norris, CDS Board Chair; Rhonda White, DP3 Architects; Carol Golden, GHS Wonder Center; Jared Richardson, Creative Builders; Dana McConnell, CDS Executive Director; Augustus Dicks, Chair Fluor Golf for Greenville; and Donna Stroud, Fluor Corporation.